I seem to be meeting a lot of people who when I ask, "Do you ever see 11:11 on your digital clock?" they answer, "All the time." I get to hear some pretty good stories about it. Now that the 11:11 CD is available I'm loving the feeling I experience listening to it! This is the first solo album I've done simply recording my own piano at home. It is a 1966 Steinway "M" and it has the sweetest sound! Click on the "LISTEN" button to hear "Meditation 5." It is a lovely waltz improvised in D flat. 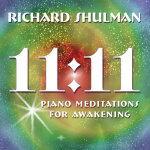 All the pieces were improvised on this album with the intent of music "for the Highest Good" relating to 11:11. (If you are a retailer you can find it at New Leaf Distributing and it is pending at other distributors). The song "Who's Up There" is sung at a campsite where our protagonists Mark, Tom and Glenda have met. Tom and Glenda like the idea of UFOs and have been to conventions about extraterrestrial life, although they haven't had a close encounter YET! Mark's kind of wary about the whole thing and hopes he won't have to meet any ET's. Glenda says there's one way to find out if UFO's are real and starts the song addressing "them" to see if anybody's up there. By the end of the song, Mark is beginning to have a more open attitude! Click on "Listen" (above) to hear the song. Glenda is sung by Lucianne Evans, Tom, by Tim Norwood, and Mark by myself. Amazing is sung later in the show, and frankly, I don't quite know the plot around it yet. It is Mark's answer to being called amazing. Mark had learned that whatever he could see he could be, and the song shows that we all have the potential to be amazing. Here is a link to my performance schedule. One of the performances will be a Music of Peace Concert, Sunday March 16th at the UR Light Center in Black Mountain.... Click on the Listen button (above) to hear "Remembrance" from the Music of Peace CD I recorded there. that is the very nature of you and all of us, reveal itself to you bringing unimaginable joy to you and all you are connected with!